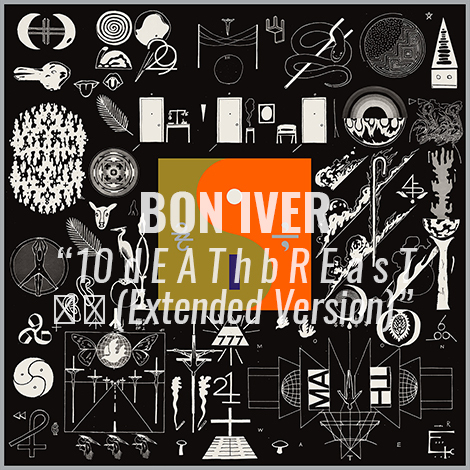 Take a listen to another lead off track (“10 d E A T h b R E a s T ⚄ ⚄” (Extended Version)) off Bon Iver’s upcoming release of 22, A Million. Bon Iver, the musical project led by Justin Vernon, will release its third studio album entitled 22, A Million, September 30th on Jagjaguwar. The album is part love letter, part final resting place of two decades of searching for self-understanding like a religion; and the inner-resolution of maybe never finding that understanding. The album’s 10 poly-fi recordings are a collection of sacred moments, love’s torment and salvation, contexts of intense memories, signs that you can pin meaning onto or disregard as coincidence. If Bon Iver built a habitat rooted in physical spaces, then 22, A Million is the letting go of that attachment to a place. The bulk of the album was recorded and produced at April Base Studios in Fall Creek, WI with pieces recorded in London, England and just outside Lisbon, Portugal by Vernon and a pack of trusted friends and collaborators both new and old. Read full album credits.